Timid Paleontologist, Dr. David Huxable (Cary Grant, His Girl Friday), gets excited about the possibility that a rich philanthropist is considering donating $1 million to his pet project. However, Dr. Huxable must first convince the wealthy woman’s lawyer to write the check. But Huxable doesn’t count on a giddy socialite, Susan Vance, (Katharine Hepburn, Long Day’s Journey Into Night), who inadvertently sabotages all his efforts to secure the much-needed donation. Have you ever had trouble describing the term “screwball comedy”? Well, I’ve found myself in the tenuous position of not being able to explain what the genre entails to non-moviegoers. 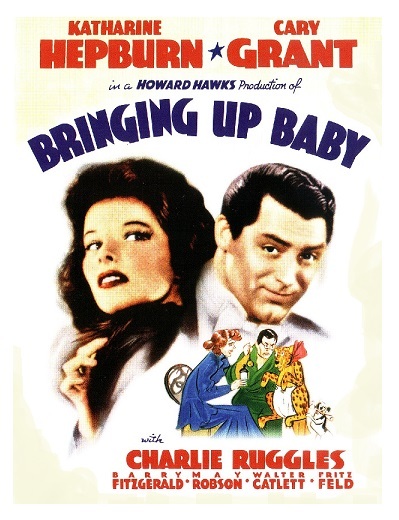 It is probably easier to just say, “Bringing Up Baby!” This legendary Howard Hawks comedy is rightly considered the definitive screwball comedy — it’s the ultimate example of silver screen lunacy. Bringing Up Baby is not my favorite screwball comedy — My Man Godfrey (1936) is probably my favorite — but it is an irresistible film that I discovered in my childhood and continues to give me great pleasure. In this anything-goes comedy you are never sure what’s going to happen next. The movie is good at deconstructing the traditional Hollywood narrative, never afraid of introducing things that don’t really make much sense. 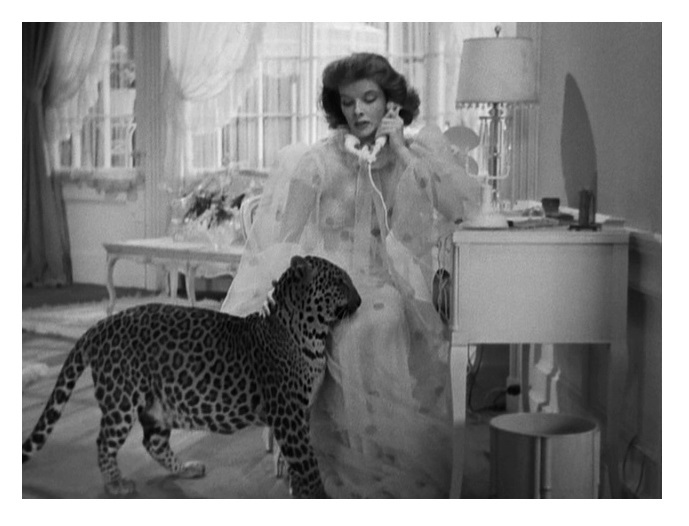 Bringing Up Baby, written by Dudley Nichols (For Whom the Bell Tolls) and Hagar Wilde, has a touch of magic realism and that makes the movie feel like a live-action cartoon. Hawks directs with an infallible sense of purpose and balance. He also relies on gibberish conversations and improvisation. The film requires multiple viewings to peel off all the layers. A lot of things have deeper meanings so you really have to pay attention. The thinly-disguised sexual innuendos are hard to miss, though. The most famous moment occurs when Cary Grant, wearing a woman’s robe, screams, “I went gay all of a sudden.” Also, the characters’ names seem to have a hidden meaning (e.g. “Mayor Applegate,” “Miss Swallow,” etc.). 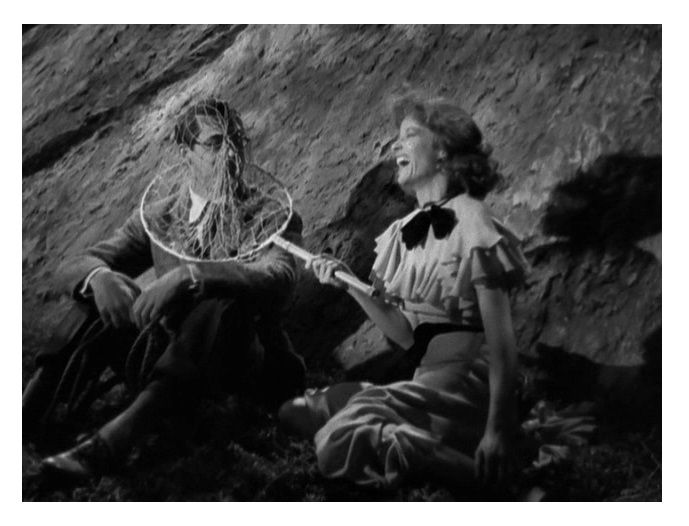 Bringing Up Baby was allegedly based on the weird relationship between Kate Hepburn and director John Ford (The Informer and The Searchers). Hepburn is essentially playing an exaggerated version of herself. Grant has never been funnier. Other cast members seize the opportunity to loosen up: Mary Robson (Lady for a Day) is hilarious as Hepburn’s aunt. Charles Ruggles (The Philadelphia Story) plays a blowhard hunter, and Asta (The Thin Man and The Awful Truth) is the mischievous canine. Character actor Jack Carson (Mildred Pierce) has a bit role. The cast also includes Barry Fitzgerald (Going My Way), and Ward Bond (The Quiet Man). 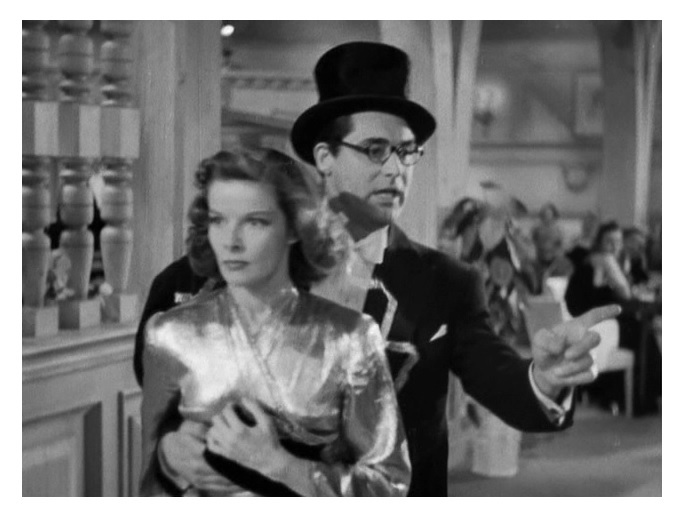 Interestingly, Bringing Up Baby was a notorious flop and yet the movie keeps growing in stature. It has influenced many other movies. I remember an interview in which the late Christopher Reeve admitted that he modeled Clark Kent after Grant’s Huxable (there is a bit of Susan Vane in Margot Kidder’s Lois Lane). It also inspired What’s Up, Doc (1972), starring Barbra Streisand and Ryan O’Neal. B&W, 102 minutes, Not Rated. Hepburn is a firecracker and she steals the show! Yes, I love Hepburn’s nuttiness here.